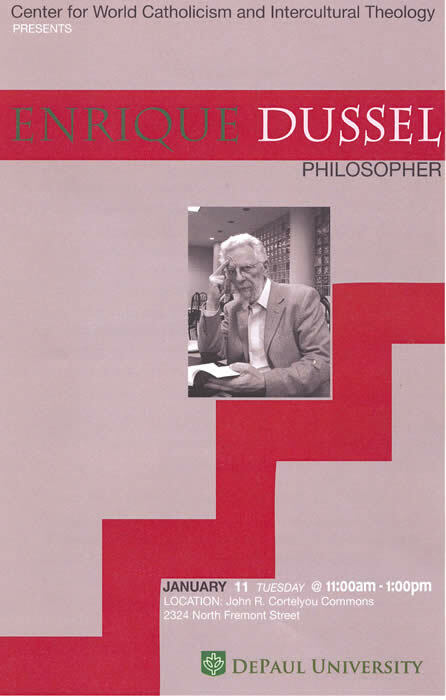 Courses, conferences and visits of Enrique Dussel. 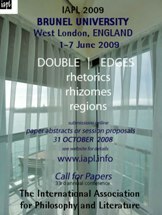 World Congress of The International Association for Philosophy and Literature, London, June 2009. 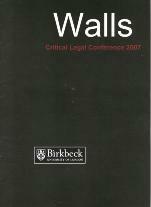 Challenge of the Global Financial Crisis,University of Oxford, London, June 2009. 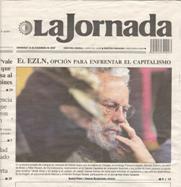 53* International Congress of Americanists, Mexico, July 2009. World Congress "Dialogue among Cultures: Peace, Justice and Harmony", Pekín, July 2009. Bicentenary of the Latin American Independence, Salamanca, Spain, October 2009. Religion and Politics in the Secular World, Fudan University, Shanghai, October 2009. Modernity in the Intercultural Perspective, Viena, Austria, December 2009. 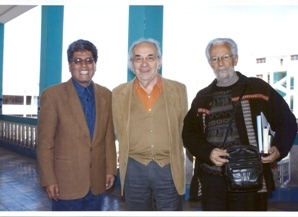 XV International Congress of Philosophy of the AFM, Mexico, January 2010. Annual Meeting of Latino Working Group, New Orleans, January 2011. Albertus-Magnus-Professor 2010, University of Koeln, Germany, June 2010. O fundador do Movimento Filosofia da Libertação e professor da UNAME/México, Enrique Dussel, compareceu nesta terça-feira (17) a 1ª Semana de Educação em Direitos Humanos, realizada na Universidade Metodista de São Paulo. O professor falou sobre "Transmodernidade, Interculturalidade e Direitos Humanos". "Na América Latina há grandes acontecimentos políticos, mas não há uma teoria que acompanha esses acontecimentos. É necessário produzir uma teoria e isso está sendo construído", afirmou Dussel. O professor também disse que os Direitos Humanos vêm por meio de instituições políticas ligadas ao sistema de legitimação do poder. Essas instituições podem ser tanto materiais quanto fundamentais. "A legitimidade de um poder vem de três leis fundamentais: participação, simetria e razão". Outro principio básico é do surgimento dos novos direitos. "Existem dois tipos de direito: o natural - que o ser humano já nasce com ele e o vigente - o qual a população instaurou. Os novos direitos vêm da luta e da consciência dos oprimidos com os direitos vigentes", explicou o filosofo. 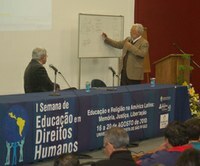 Após a palestra Dussel participou de uma mesa-redonda sobre "Caminhos da Pesquisa em Filosofia, Educação e Ciências da Religião". Além dele estavam presentes os professores da Metodista, Jung Mo Sung e Danilo Di Manno de Almeida. 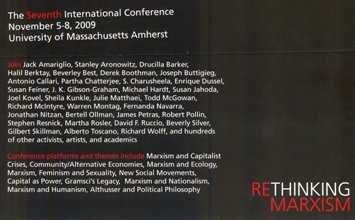 RETHINKING MARXISM: a journal of economics, culture & society is pleased to announce its 7th international conference, to be held at the University of Massachusetts in Amherst on 5-8 November 2009. RETHINKING MARXISM's six previous international conferences have each attracted more than 1000 students, scholars, and activists. They have included keynote addresses and plenary sessions, formal papers, roundtables, workshops, art exhibitions, video presentations, activist discussions, and cultural performances. 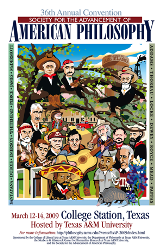 Similar events are planned for the next international conference, RM09: New Marxian Times. Some lecturers were: Enrique Dussel, Michael Hardt, Sheila Kunde, David F. Ruccio, Bertell Ollman, Fernanda Navarra, Derek Boothman, and hundreds of other activists, artists, and academics. Conference of the Human Development and Capability Association. 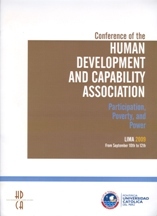 The International Conference of the Human Development and Capability Association (HDCA) sets out to explore the relationships between participation, poverty and power from the perspective of their contribution to human development and capabilities. The Conference has as a main purpose the analysis and deeper understanding of how power structures can be changed in order to advance the capabilities of the poor, particularly in contexts where there is ethnic, racial, regional, or religious diversity. There will be an emphasis on the role of political participation by the deprived. The Caribbean Philosophical Association (CPA) invites proposals from scholars in any discipline who aim to “shift the geography of reason” by exploring critical, theoretical, and creative questions about or relating to the Caribbean, its Diaspora, and the “global south” more generally, including the South in the North. We particularly welcome North-South and South-South intersections and/or dialogues. The theme for this meeting deals with migrations and diaspora. 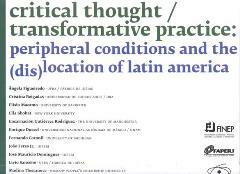 While proposals dealing with the broader organizing theme of the CPA (“shifting the geography of reason”) will be welcome, the organizers are especially interested in presentations and panels that highlight questions about space, traveling, national and transnational communities, gender and sexuality, and issues of race and identity across migrations and diasporas not only in the Caribbean, but globally. We accept proposals in English, French, and Spanish. 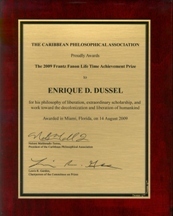 The CPA offered the Frantz Fanon Prize 2009 to Erique Dussel, for his Philosophy of Liberation, extraordinary scholarship, and work toward the decolonization and liberation of humankind. ........................................................... Plaque "Frantz Fanon Prize"
III Seminar-International Workshop : " Towards the construction of the horizon of decolonization and interculturality"
.....................................................Juan José Bautista, Hugo Zemelman and E.D. 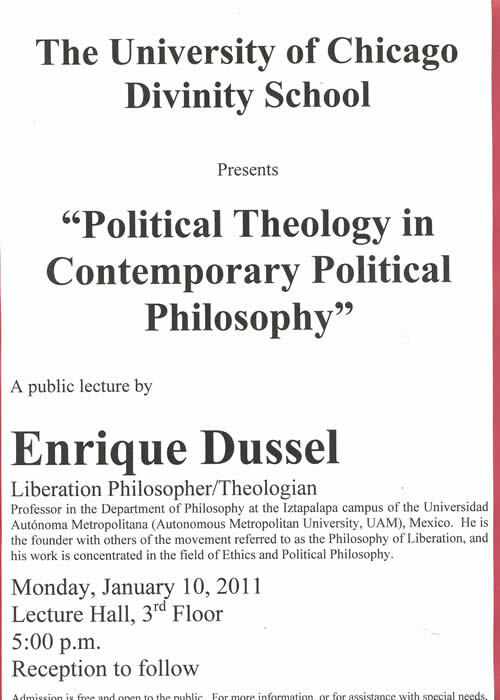 This conference brings together students, faculty and other members of the community with leading scholar-activists from around the world, including Daniel Ellsberg (of Pentagon Papers fame), Saskia Sassen, Immanuel Wallerstein, and Enrique Dussel, leading philosopher and historian of the Catholic Church in Latin America, and artists and poets to focus on cutting-edge research and debates about the challenges of the 21st century, with a special emphasis on issues of diversity, inclusion, the dignity of all persons and social justice.World-systems analysis, coming out of the movements of the 1960s, and as critique of existing structures of knowledge, violence and power, has made important contributions to our understanding of the U.S. and the global system. 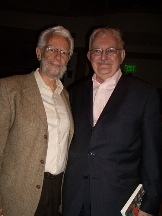 These analyses have ranged from nuanced explorations of world-regions, to the changing social foundations of successive hegemonies, to global power and inequalities - including of race, ethnicity, class, gender and nation, and ranging from studies of indigenous and immigrant communities in the US to struggles for diversity and racial and socio-economic justice in the US and across the globe. 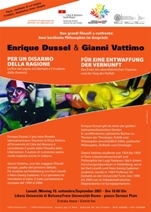 Featured Speakers include Giovanni Arrighi, Enrique Dussel, Daniel Ellsberg, Saskia Sassen and Immanuel Wallerstein. A NEW AGE IN THE HISTORY OF PHILOSOPHY: THE WORLD DIALOGUE BETWEEN PHILOSOPHICAL TRADITIONS. Seen from the vantage point of the periphery as well as of minorities and gendered/racialized Others in both the periphery and the core, neoliberal capitalism, globalization, and the “end of history” type of approach to social reality act as subalternizing discourses set on furthering the current imbalance of economic, political and epistemic power between the West and the Rest. In contrast, peripheral conditions – be they geographical, political, socio-economic, ontological, or all of the above – have increasingly been conceptualized as constituting a locus of resistance and transformative potential for those at the subaltern end of the power differential.